J.Crew’s latest promo, YESPLEASE, ends today. You can take 30% off a lots of styles as well as 40% off sale. I took advantage of this promo in-store and brought some full-price items home with me. Let’s take a look. These lovely pants were included in the promo. I was going to order them but happened to stop by my store and they had them available in almost all sizes. They did not have a size 8 so I grabbed a size 6 and a size 10, just to gauge fit so I could order them. I really feel these pants run small. I know I’ve been having some sizing issues due to weight but I can still fit in my size 8 pants from years prior. And I’m still wearing size 29 pants and jeans from this year just fine. 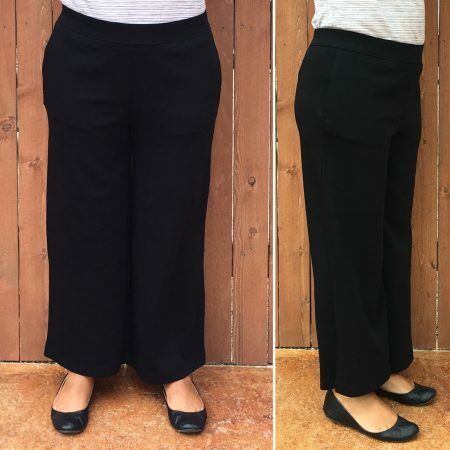 I think the sizing issue has to do with the pleats starting at the hip line. Despite sizing up to a 10, I loved these wide-leg pants. 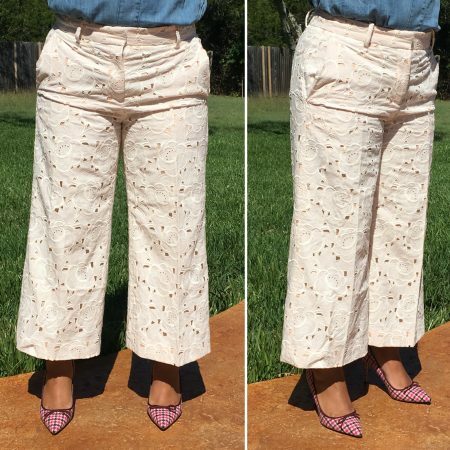 I plan on wearing these wide-leg pants not only for dressy but not formal occasions but also trying to tone them down with a tee or jean jacket or maybe even some Cons. 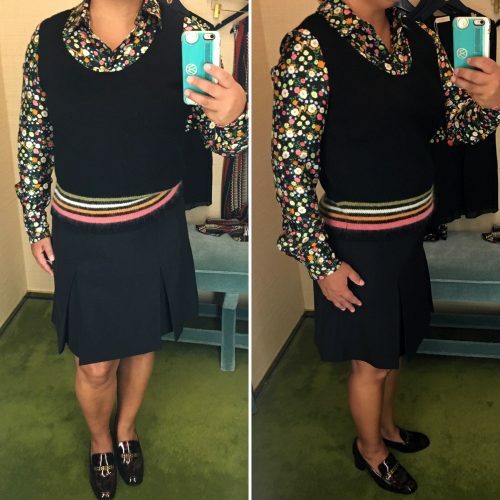 I found this Cashmere Audrey Sweater at Talbots in Dark Nightfall that goes very well with these. I’ll be sharing my styling ideas for these pants next week. I have these in black (styled) and love them. These have had a second price cut and are now $149.99. I still ordered a size 8 though a 10 might have fit a little better. They were F/S so I’ll make them work. I love these lace pants and am going to try to winterize this Ivory color. If I can get the right combinations I’ll share those style ideas with you. I usually get this popover in a size 6 but the chambray was all sold out so I ordered the 8 Petite. That fits a little more closer to the body and is not as loose as the 6. I think I’ll get quite a bit of use out of this chambray shirt. 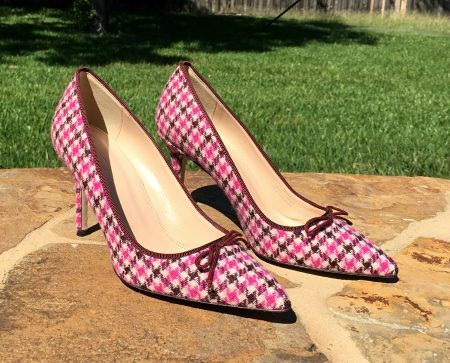 I can take a 6 1/2 or 7 in the Elsie Pump, depending on how long I think I’ll wear them. I think I would probably try to wear these for long periods of time so I ordered the size 7 to accommodate foot swelling. They really fit in the toe box but the length is just a little too long. I don’t walk out of the size 7 or anything like that. 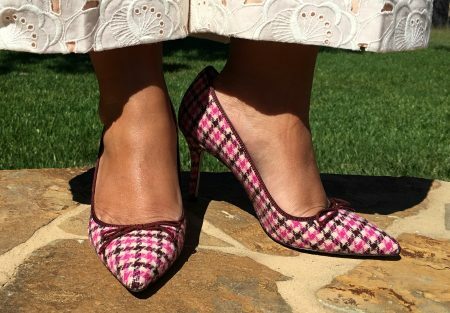 I love this pink tweed pattern and color and am happy I chose it over the skirt or blazer. 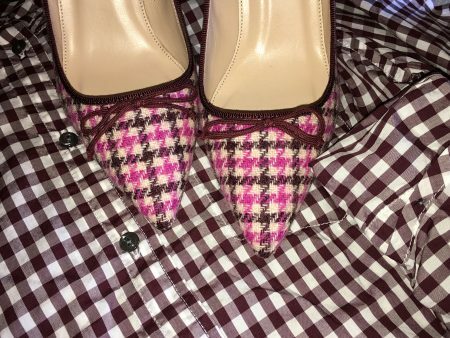 I bought the Club Collar Shirt in Gingham in the White Cabernet and I can’t wait to wear it with these tweed heels. Here are a few more of my picks from this promo. I have the Factory version of the Excursion Vest in Flannel. I don’t really care for the gold buttons on the pockets of the retail Excursion Vest. I like the style of the Factory Quilted Vest a lot more. Did you take advantage of this latest 30% off promo from J.Crew? Madewell had a great promo over a week ago that I took advantage of. I didn’t have an opportunity to shop the store at that time and I wanted to try on some of their wide-leg pants. 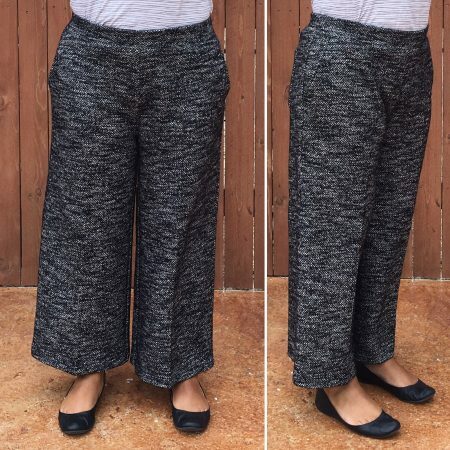 I really liked the look of these marled pants and the wool/cotton blend was very comfortable. 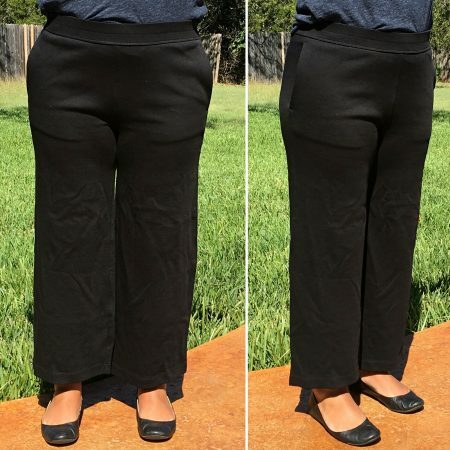 The waist is elastic but not the bunchy kind, making these pull-on pants. The wide-leg is nice and roomy but the front fit a little weird, pulling a bit. I though it was because of my hips but there was room enough there. Maybe the waist could have been a little looser. The length hit me right at the ankle bone though I would have liked them a little bit shorter since they were supposed to be cropped. Overall, I didn’t like the way they looked, especially in the front so I returned them. I loved these lounge pants immediately but they ran a little big on me in the Medium. They were very loose in the waist, even though it’s elastic, as well as through the hips. Luckily, my store had these in-stock and I was able to try on and exchange them for a Small. These are much better fit and they are so comfortable. I know there will be days when I won’t want to put on a dress or jeans and these lounge pants will come in so handy on those days. They even have pockets. I don’t like to wear lounge clothes outside the house but these are good for a quick run to grab lunch from a drive-through. I only wish they had come in a charcoal gray. The black will make all kinds of pet hair and other fuzz more noticeable. I was excited to see these since they are in this beautiful Cabernet color and they are cords. There is a back, exposed zip but I don’t mind that since it probably won’t be seen. The rise is higher at 11 1/2 inches, which I’m not used to wearing. The 29 is a great fit though the length is not quite crop but not quite all the way to the floor. I think they’ll still be ok to wear with flats. I think I may just hem these. Once I have some styling ideas I’ll know for sure. These are the same pant, I just used a flash on one of the images. The color looks more like the image on the right. 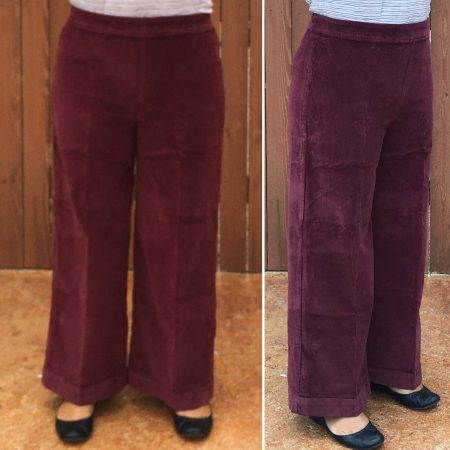 The Wide-Leg Crop Jeans in Corduroy also come in “Ink”. There’s a matching vest to the Marled Wide-Leg Pant. J.Crew is finishing up their latest sale, YESPLEASE, with 30% off quite a few recent releases. New arrivals will be in-stores next week and my VPS tells me it’s the first Holiday roll-out. 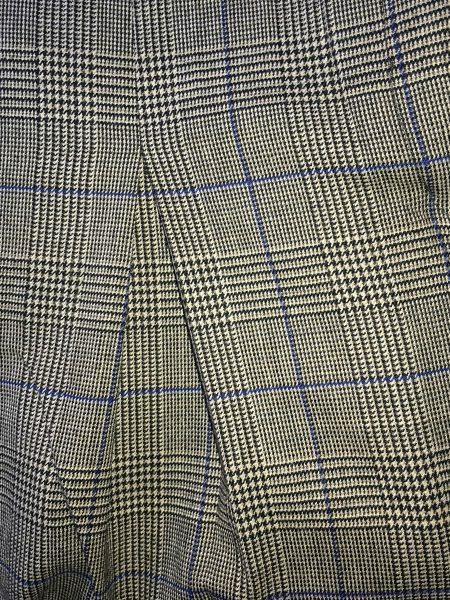 I made a few purchases in-store, which included the Wide-Leg Crop Pant in Glen Plaid. I’ll share that review with you this week. Madewell has a nice promo right now through Monday, October 3rd. You can take 20% off your $100 order or 30% off your $200 order, with code GOODBUY. Though it’s not stated, it does look like all jeans are excluded. But, all Transport items like the Tote, Crossbody and Weekender are all included! 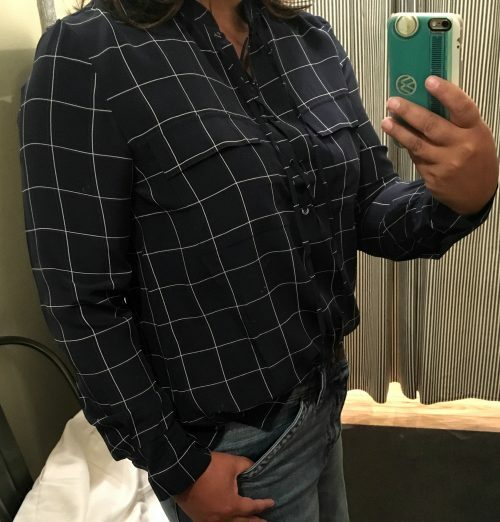 I did go into the store a few weeks ago and was able to try a few things on. This Windowpane Top caught my eye, especially being aware that J.Crew had just come out with a windowpane shirt as well. 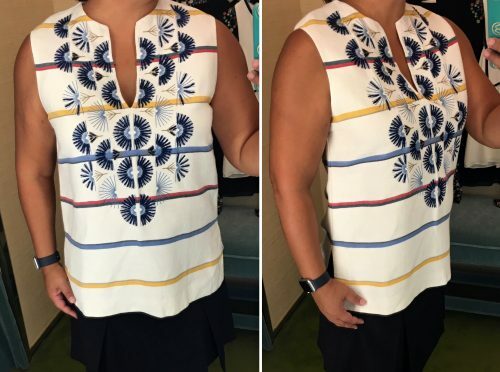 It’s a little more unique from other shirts in that it has a lace-up front neckline. I have the laces pulled tight but this will require a cami underneath, especially if you want to make this work appropriate. I prefer these seamless camis from The Limited. I have several in various colors and they hug the body and feel like you aren’t even wearing them. I could have used a Small throughout the body but the Medium fit much better in the shoulders and arms for me. I don’t plan on wearing this with anything other than jeans or cords so the slouchy look is fine with me. 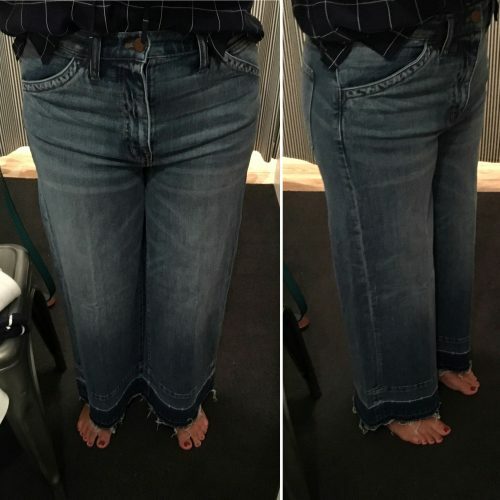 Whenever I see a wide-leg jean, I have to try it on. I’m still searching for another great pair, after last year’s success with the Wide-Leg Crop Jeans from J.Crew. These have a “drop-hem” which I don’t really care for. If these had stayed hemmed up they would have been the perfect crop length. 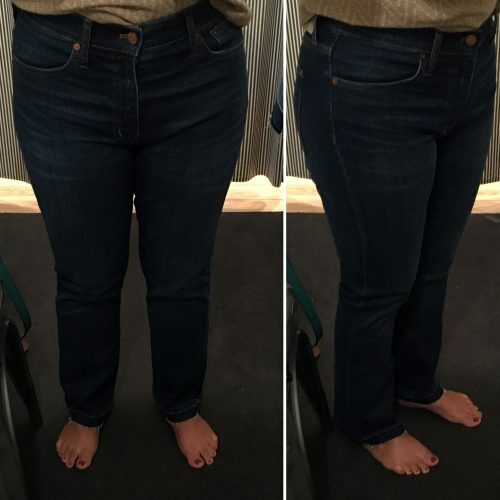 The fit of the size 29 were fine but overall, due to the drop-hem, they were a pass for me. The search continues. 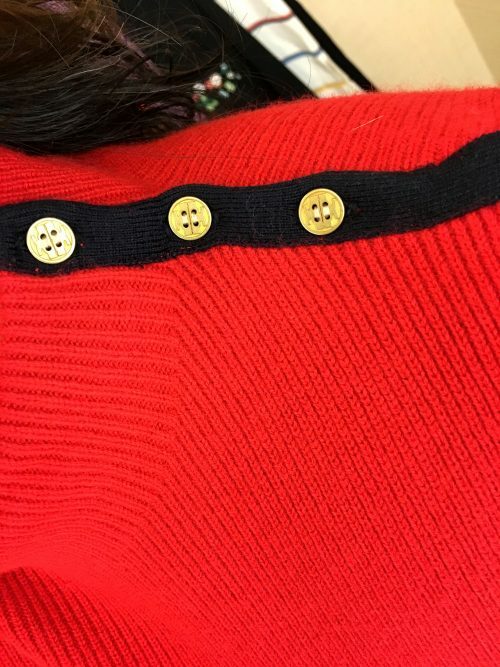 I liked this little sweater immediately on the hanger. I have an aversion to turtlenecks that are too tight and feel like they are choking me. 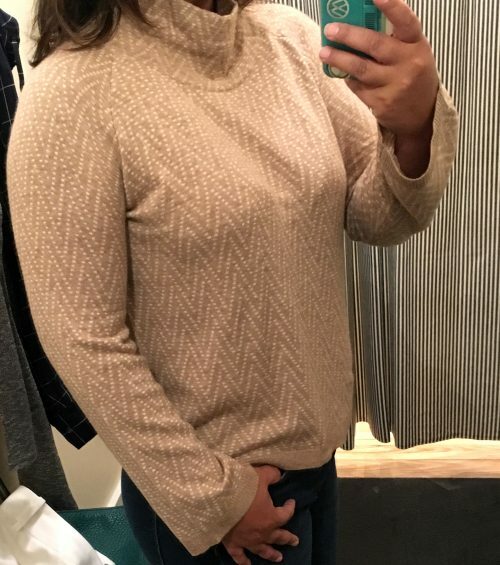 This sweater has a loose mockneck. The sleeves are a little loose at the cuff but not bell-sleeve. I like the fit of the Small as I’m sure it will stretch out some. It also comes in Heather Pebble and Black. Another drop-hem jean but I tried this on for the wash as well as to see how the Cali Demi Boot jean fit. I really like the fit and even the higher rise. They were a bit snug in the size 29 when I tried them on but they according to the reviews they will stretch some. I think because of the drop-hem you can’t really see the little flare at the hem. Had these been included in the promo I would have ordered the Donovan Wash.
I’m always looking for cozy dresses to wear in late Fall and Winter with tights and boots. 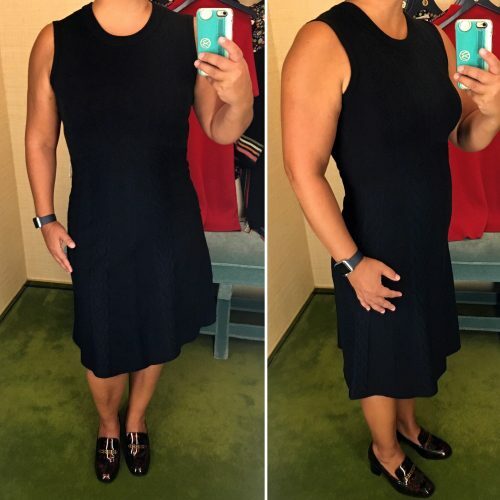 This ribbed jersey dress feels so comfortable on but the Small looked bigger on the hanger. I would size to my normal Medium in this dress. Even though it’s included in the current promo, it’s not even remotely Fall around here. I hope I will be able to grab this one when it goes to sale. I would love to see this dress in more colors too. 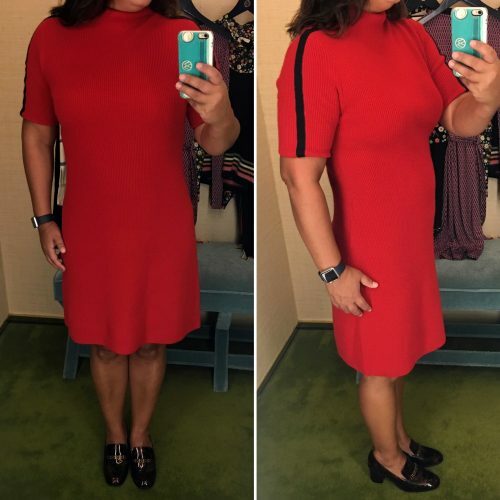 It’s a great little dress for running around town, working from home or going to a little Fall Festival. 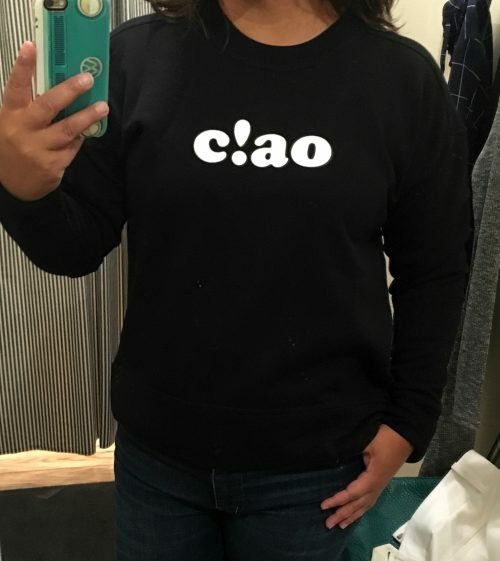 This is a really cute sweatshirt but has a drop-shoulder and a wide hem. It still draped well in the Medium and I wouldn’t size down. It’s nice and comfortable but I can see myself only wearing this around the house. I also prefer to layer with shirts and cardigans, in case it warms up during the day. This sweatshirt seems to be sold out online but I am sure there are still some in-stores. There’s also a tee in white with red lettering. 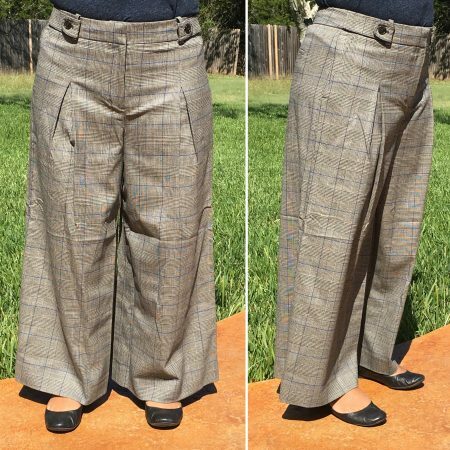 I did place an order, all for pants and all wide-leg crop. I’ll share my reviews of them when they arrive. Are you shopping the Madewell promo GOODBUY? There are some great dresses at Tory Burch this season though the Cora Dress will always be my favorite. I liked all but one of what I tried on. This dress is made of merino wool with a fit-and-flare style and cable-knit design. I found the Small to fit just a little snug but due to the style I wouldn’t size up. The length hits be just below the knee. 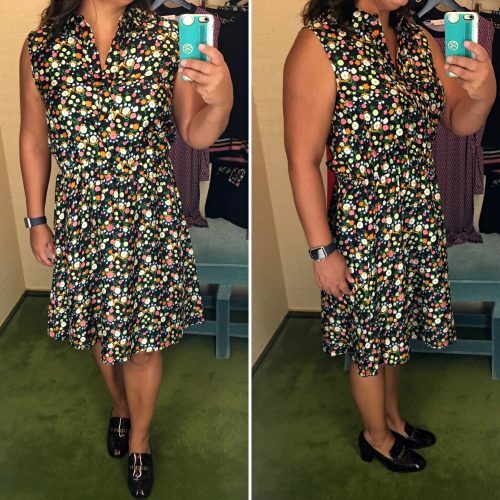 It’s really cute and I think it would be a great work dress. There’s a matching cardigan as well. 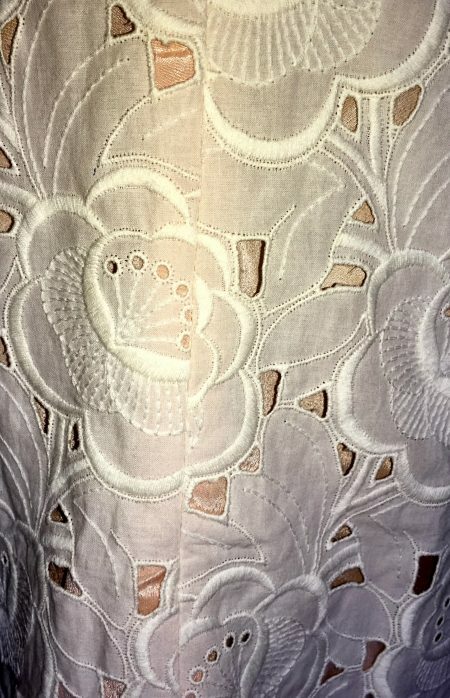 This is made of a silk jersey, which I love but fit really small. This dress isn’t made for curves. I am not even sure if the Large would fit well. The belt doesn’t help to create any shape either. The length hits above the knee and the dress is a pullover-style. 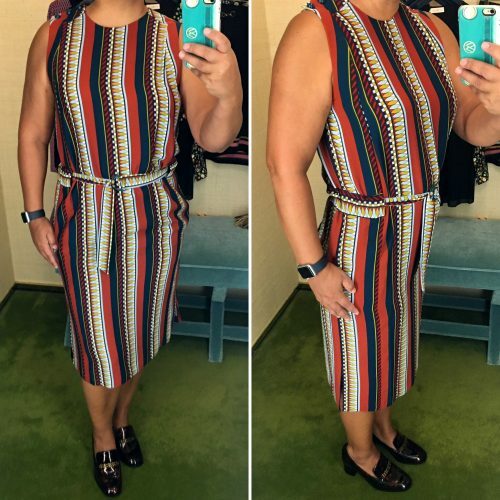 The geometric design is cute but there’s too much that’s wrong with this dress to buy it, even on sale. Here’s another silk jersey dress that fits much better in a numbered size. I love the pattern and perfect Fall colors on it. The belt matches the dress and has a d-ring closure. I think this dress would be better suited with a different belt since the current one isn’t very structured. The length is actually good on me and what I would consider midi, for my height. 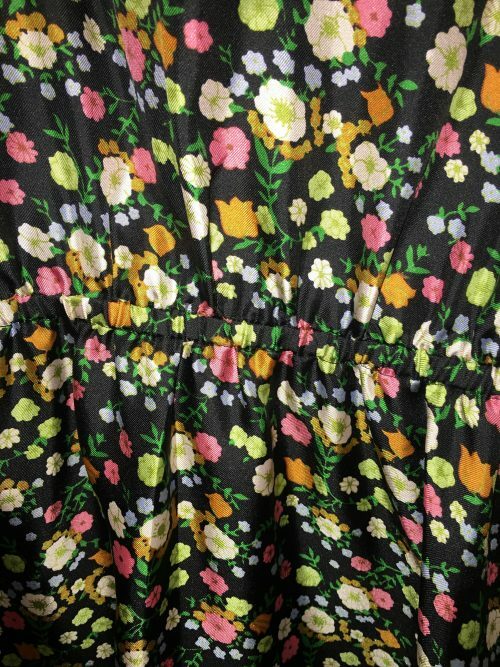 There are side slits at the hem allowing some movement in the skirt. 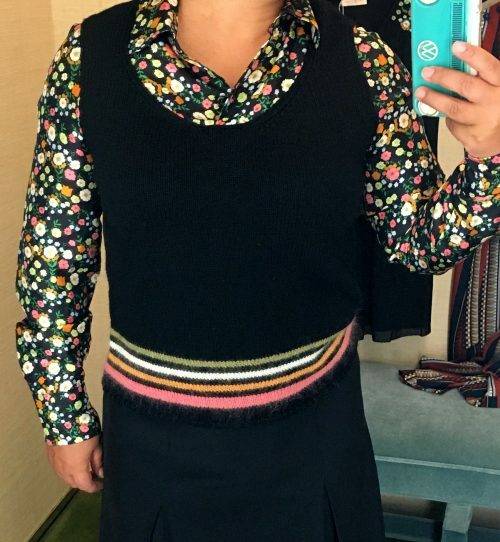 I can see wearing a good chunky sweater over this for Fall. This dress is also on sale. This sporty little dress is made of Merino Wool. It slips over the head without having to un-do any buttons at the shoulder. 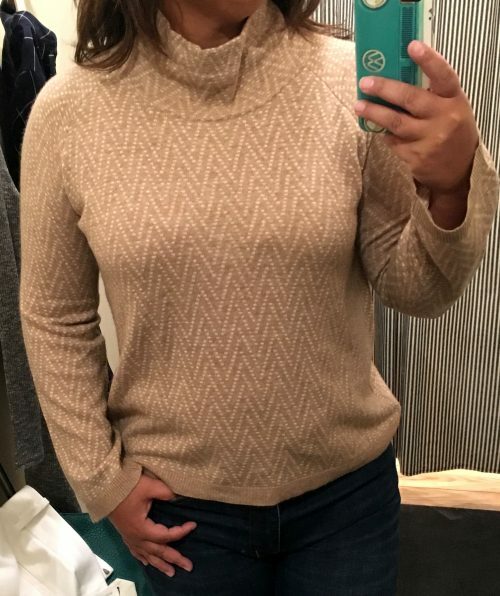 The mock neck isn’t tight and always something I look for in turtleneck-style items. The medium was a great fit too. This was a dress I really liked and will try to get it on sale in the Navy which has a green racing stripe. If you prefer, there is a sweater. This dress was my favorite of everything I tried on. It is 100% silk twill and has an elastic waist. I’m a sucker for Tory’s silk dresses, especially if they are a shirt-dress style. I easily came up with three different ways to style this dress. 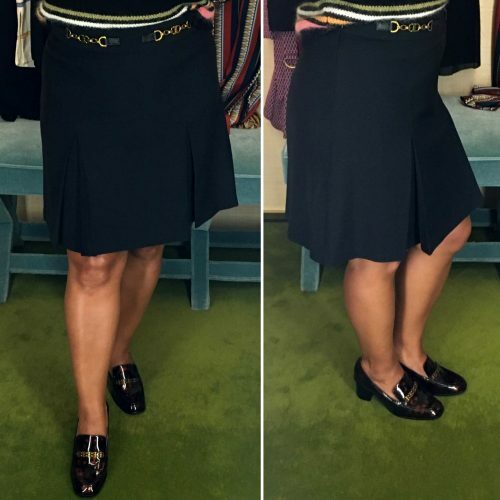 I also love how the dress looks with the Tortoise Loafers. I ended up purchasing the Ryder Dress, Gemini Link Printed Patent Loafers and the Blossom T-Strap Flat. 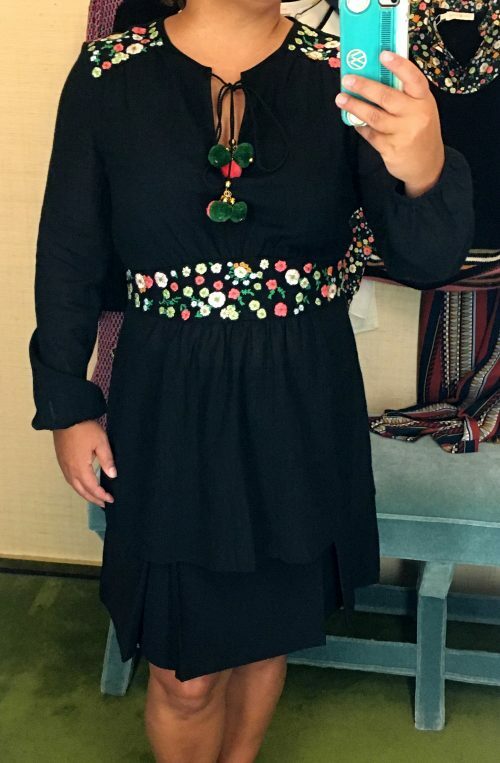 I think it will be a unique little black flat to wear this Fall. I have some outfit ideas for the Ryder Dress that I’ll be sharing with you soon! Tory Burch is having a wonderful Fall promo where you can take 30% off your purchase of $250 or more, with code FALL16. 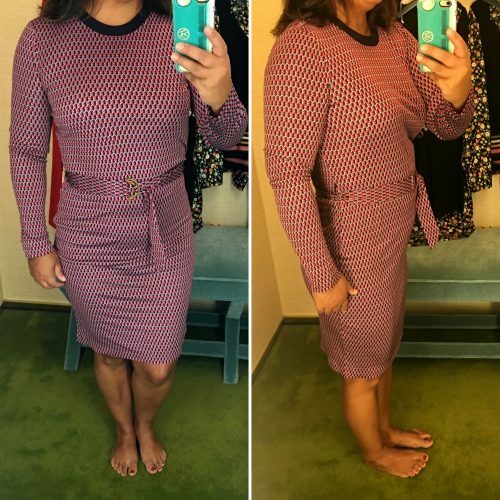 I had just happened to visit the store last week and was able to try on some new arrivals as well as some recent markdowns. Hearing the word “dickey” makes me think of 70s style. The silk-twill floral print is layered under a merino vest with a striped hem – layers without the bulk. The Medium fit well. The colors in the shirt portion are pretty and vibrant against the black background. Of course, if you prefer the actual layers you can choose the Azra Bow Blouse and Seine Sweater. 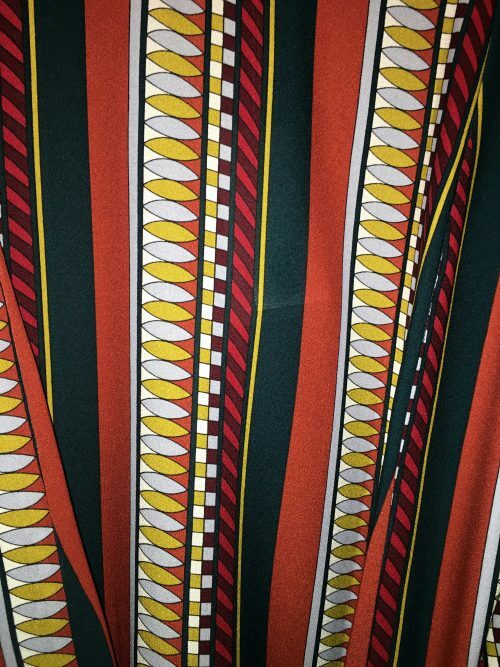 This skirt also comes in Redwood, which what I originally saw in the store. Unfortunately, they didn’t have a size 8 or 10 to try on in that color but there was an 8 in the black. The size 8 fit really well and the length is above the knee on me. The inverted pleats don’t puff out too much and the waist is detail with leather tabs and Gemini Links. I liked the black but do prefer the Redwood color. 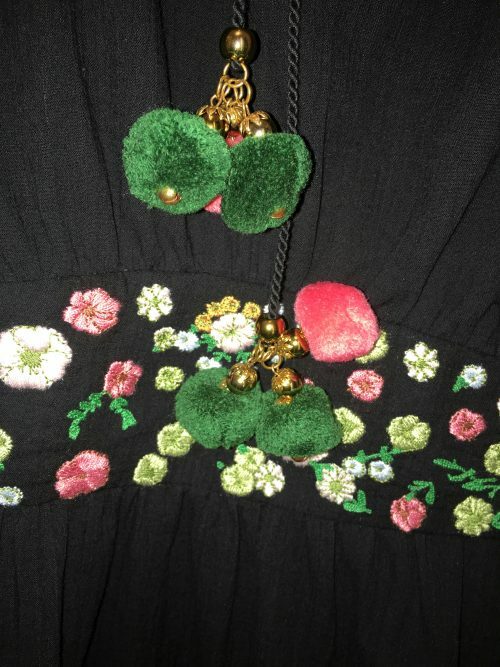 I always look for an interesting tunic to try on when I’m in the store and found this one with little pom-poms. The metal the poms were attached to jingled. I didn’t walk around but did notice the jingling when I was tying the neckline. The floral print from the Dickey Sweater is embroidered at the shoulders and waist on the Fleur Tunic. The size 8 fit well in this cute cotton tunic. This style of blouse doesn’t quite work with my chest. The front has a few hook-and-eye closures and you can see they are pulling just a bit. 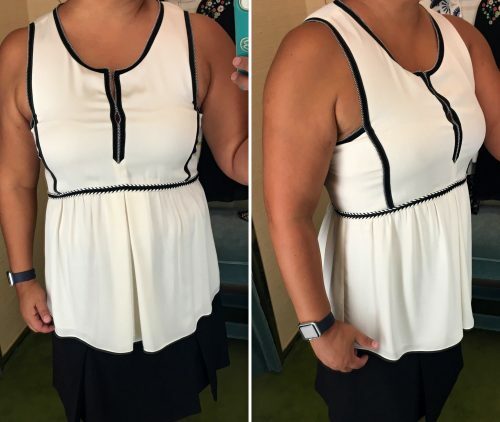 I would size to a 10 in this top to have a little more comfortable fit. 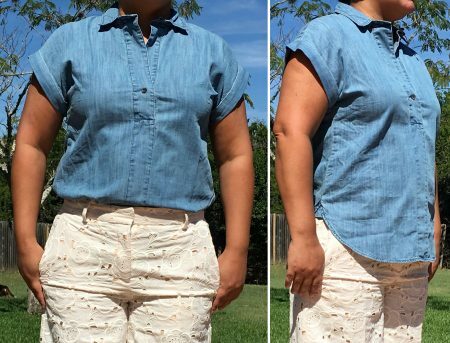 The waistline is a little higher and there’s a pleat down the center on the bottom. This little babydoll top wasn’t really my style and I’m afraid that if I did size to a 10, it might get too loose. I have been watching this top since it arrived online. I resisted buying it full-price or with a promo even though I had several options to wear with this striped tunic. 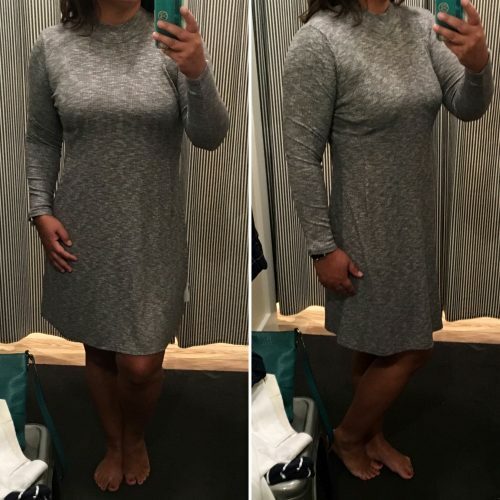 I finally tried it on last week and the size 6 fit well, making this tunic run big. It had also made another round of price cuts and was marked to $118. I still didn’t buy it. I think it’s a little too boxy and could have a little shape at the waist. Of course, buying this as an add-on, with the 30% off does make this tunic more appealing to add to my closet. 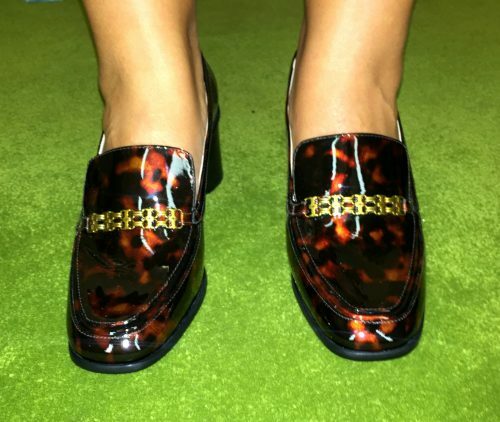 These Tortoise loafers were gorgeous IRL. They have the Gemini Link detail across the front and a stacked mid-heel. When you look at the bottom, the heel is shaped like a horseshoe. You’ll be lucky wherever you go when you wear these Tortoise Loafers. 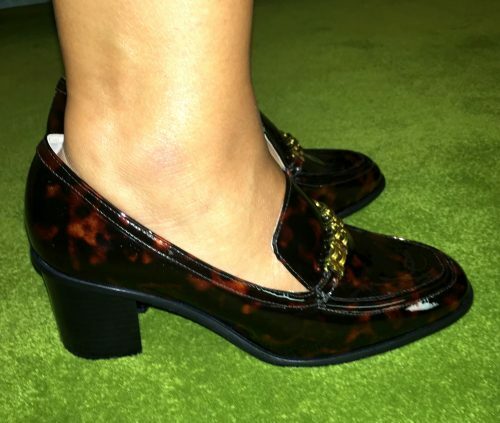 You know I’ve tried in the past to find a great pair of patent tortoise flats. I think these are probably one of the best tortoise pair I’ve found. They aren’t flats, but are a comfortable 2 1/2-inch heel. They also went so well with everything I tried on. You’ll see more of these in tomorrow’s post. If you don’t prefer the patent tortoise, there is also the solid loafer in Jtiney Green or Navy. There is also a flat loafer in black, redwood or calf-hair. If you want something different in the patent tortoise, try the bootie, pump or either (one, two) mule. I’ll have a few dresses from Tory Burch for you tomorrow. Happy Friday!